with a cosmos of kissable freckles. fever in her big house down the street. fat brush Mama gave me on my seventh birthday. and for being encouraged to roller-skate in our third floor ballroom. Hooray for Day 25 of NaPoWriMo! Our optional prompt today was to write a poem using “Anaphora, a literary term for the practice of repeating certain words or phrases at the beginning of multiple clauses or, in the case of a poem, multiple lines…Allen Ginsberg used it in ‘Howl,’ …[and it was a featured in] Martin Luther King Jr’s ‘I Have a Dream’ speech [as well]. 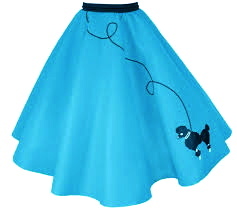 Poodle skirt photo from hiphop50sshop. Thanks, Christine. I appreciate your stoping by these woods. It’s funny how when you start to write about gratitude the damn breaks and a zillion memories pour out. I had to stop myself…save the next wave for another time. All the best. I’m truly in awe that you’ve written a poem every day this month and each so different. I’m inspired to do a poetry course– perhaps end of summer after I put together the anthology. I think you would love the process of daily poeming, cg, though, holy cow!, it’s a demanding endeavor. I’d love reading your poetry, seeing how you’d rise to the challenges. Thanks for reading my stuff! Wonderful! So evocative and full of love… and gratitude. What a sweet comment, Andy! That’s exactly the way I felt writing the poem. This kind of piece really puts things into perspective, I think, because one is forced to look back. Kind of what you do, plus you look out, daily. Viva Padden Creek! Gratitude is a great mindset. whets the appetite for more–love the drift of impressions acting as flashes of insight. Thanks, jd. I have done journals of gratitude, complete with illustrations and that format, perhaps, suits me better. This poem got me to thinking, though. i loved the flashes of images and i never knew that this was a type of poem (of course, my lack of knowledge of poetry is legendary) but it is the type of poem i’ve loved best. btw, i heard him read the howl in santa monica as well as another poem about dying and not being able to get it up anymore. writing conference, amazing. i feel blessed to have heard him live. You’re so lucky to have heard him! I did via vid and tapes, of course, and bought the book Howl. The poem was magnificent! I love this bouquet of thanks. I like what you selected and how you described each: all good — even Rachel. I like the phrases that pop up in your daily poems, like “cosmos of kissable freckles”. I like your stories like the one here about the hospital rounds. WG, thank you. I’m glowing from the positive power of your words. I really appreciate that you’re enjoying my poems. All the best.